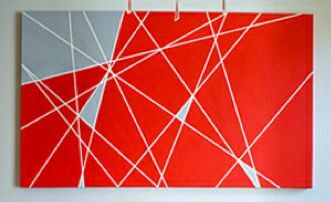 When it comes to creating art for your home, it can sometimes be a headache. Getting all of the supplies and cleaning up after seem to be more of a hassle than completing the project. 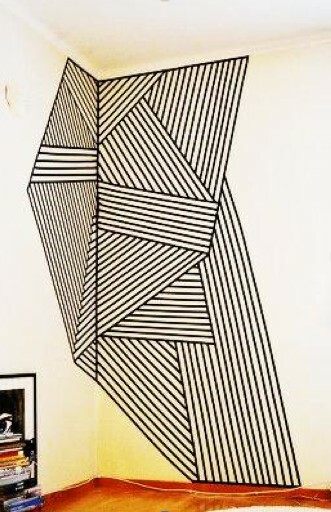 That’s why tape is a great way to add an artistic touch to your home. Yea that’s right, tape! 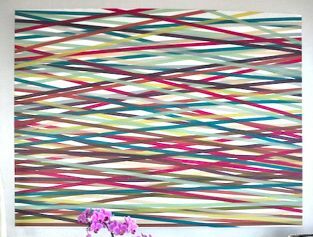 Tape is a great choice for diy art because it’s inexpensive, it doesn’t cause damage to walls or furniture and it’s easy to clean up. 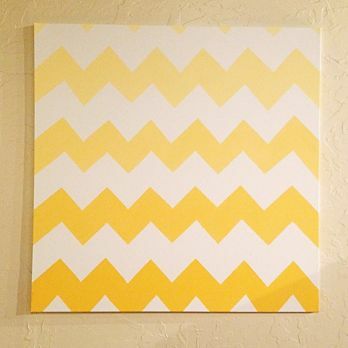 For this project all you need is painters tape, paint and a canvas (or shoebox top). Choose a base color to paint your surface. After the paint has dried place the tape in any pattern or shape that you want to. Then paint your taped off sections any color you choose. 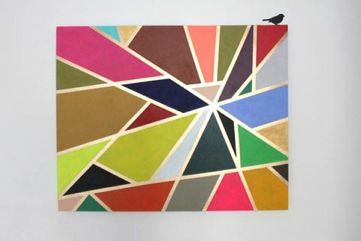 Wait until that dries to peel the tape off and enjoy your new piece of art. Is using paint still a little too messy for you? Well you’re in luck; tape is also awesome by itself. 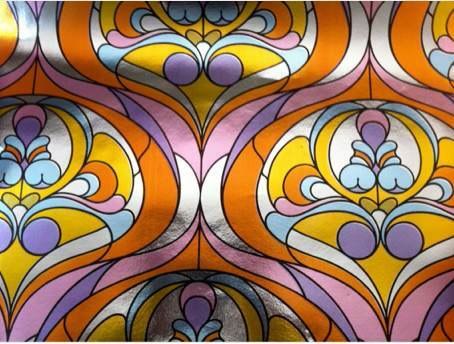 There are tons of different decorative tapes to choose from. 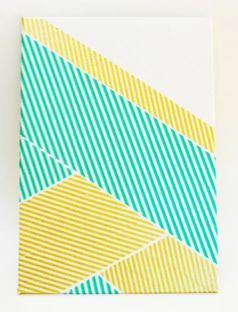 One of the most popular craft tape is washi tape. This Japanese tape is made of paper, very durable and come in hundreds of different colors and patterns. 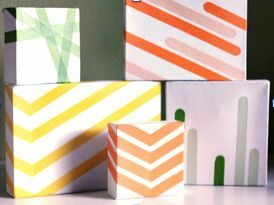 You can find inexpensive washi tape from Cutetape.com and Etsy.com. 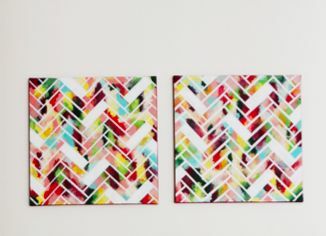 To make tape art, all you need is tape (duh), a canvas (or a wall). 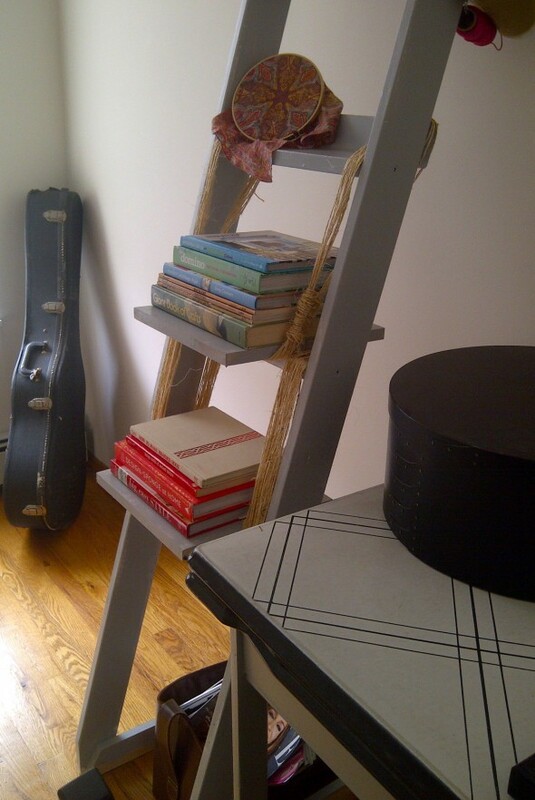 I happened to find this ladder on the sidewalk deep in the middle of my Ladder Bookshelf obsession, that or it spawned my obsession…chicken,egg. When I convinced the boyfriend to help me bring a completely useless ladder home late one night, I was still pretty unsure what exactly it would turn into. Not wanting to let on and risk losing the manpower, I rattled off some vague bookshelf project and started brainstorming in my head. 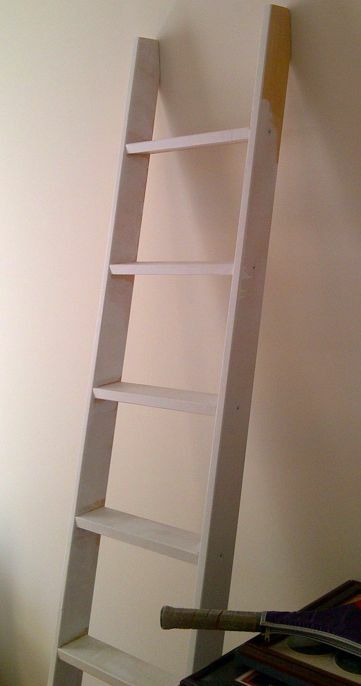 This ladder belonged to a standard issue set of bunk beds, therefore the wood was a bright laminated pine, with the feet cut at angles to best warrant leaning and climbing. While perfectly reasonable for a bunk bed ladder, it made it almost impossible to keep the ladder upright. After a few trips to Loews wandering around, doing my best not to look like the clueless girl among contractor men, I decided that building some sort of square base would take the pressure off the angled feet and keep it from sliding. In the end I made a very basic square base and will probably add the pads that are on the bottom of chairs to curb any sliding. Bracketing into the wall is also a good way to secure the ladder, but being a renter I don’t really want to go there! There are a couple different ways to do this project, all involving some manner of the same additions. Below are some ideas for turning this ladder into a functioning piece in your house! Amazing use for a ladder! 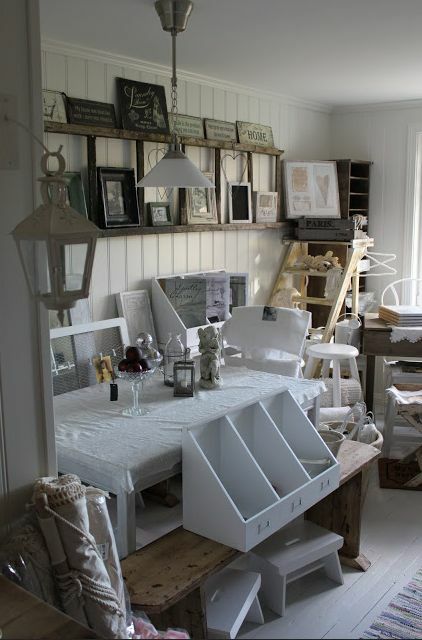 While my ladder is more “little boys room” than “beautiful design showroom in Norway”, the concept is beautiful and would be a great take on a traditional wall mounted shelf. With the right paint color and items on display it could be a really fun piece in any room. 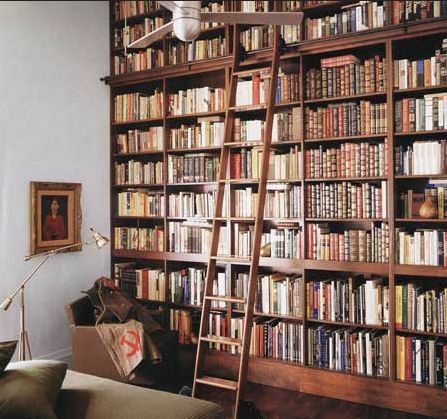 In a perfect world I would have a massive sunny house, with hundreds of built in bookshelves and cabinets and would NEED a traditional library ladder. While I am a lifetime away from that, the idea of a library ladder has always been so attractive. Even with a standard tall bookshelf, if given the right base, the ladder could be simply propped up against the bookshelf to mimic the idea of a library ladder! 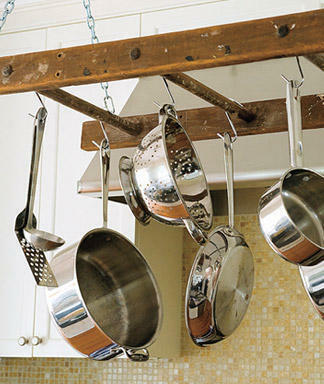 Another slightly more advanced project would be to create a pot rack from an old ladder. If the wood of the ladder sturdy enough, it could easily be mounted and hung from the ceiling to add some charm to a usually standard pot rack. Pot racks in the right kitchen as a fun way to display all your pots and pans and any variation on the traditional style would be great! I decided to go with a bookshelf/craft “closet”/office organizer. I added a few squares of craft wood to the bottom two rungs to create larger shelves, added a backboard to one for even more shelving and created a square base on the bottom. I painted with the grey paint I had from last weeks table project and went crazy with about 100 ft. of sisal twine to create some texture and add a rustic element. I am SO excited with the end result. By turning this into shelving, it can be used in ANY room in the house; bathroom storage for towels, bedside table with a funky clip on lamp, bookshelves anywhere, office supplies…the uses are endless! Welcome to Sidewalk Score, where our writer Fran finds junk on the street and turns it into something special. This is one of the coolest tables I have ever seen! Found on the street, covered in dust, with a “FREE, TAKE ME HOME” sticky on it, I knew this table was something special (aka worth carrying up 2 very narrow flights of stairs to my apartment). It has an all-metal top, including two hidden leaves. The entire expansion system works on a system of springs that lifts the table top up, pulls out and locks the two leaves into place to make a tight, flat surface. 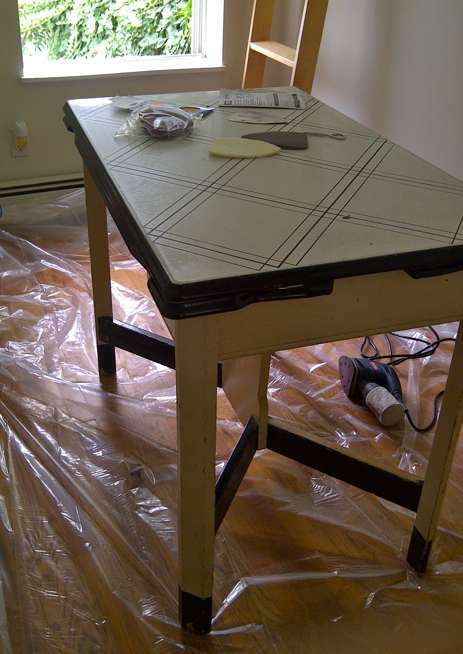 The legs of this table had been painted half off-white, half black and had seen better days. They needed to be fixed up a bit to really bring this table back to life! Hot pink would really be a great way to give this table some punch. You pretty much can’t go wrong with hot pink and B&W but almost any bright color would work in this situation. Metallic! Gold or Silver legs on this table would really take it up a notch. 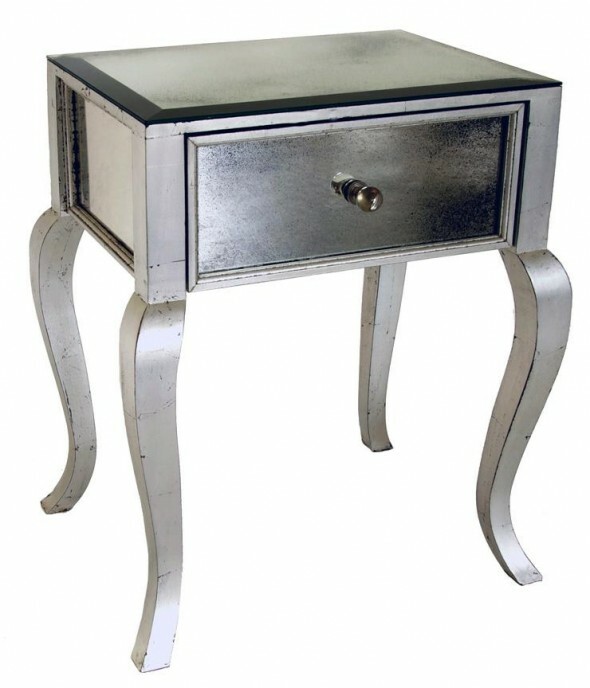 Again, with the top of the table being very versatile you could do a nice warm gold or a brushed silver paint on the base; I would avoid a chrome finish or anything that is too shiny, it would look out of place. Feeling lucky? 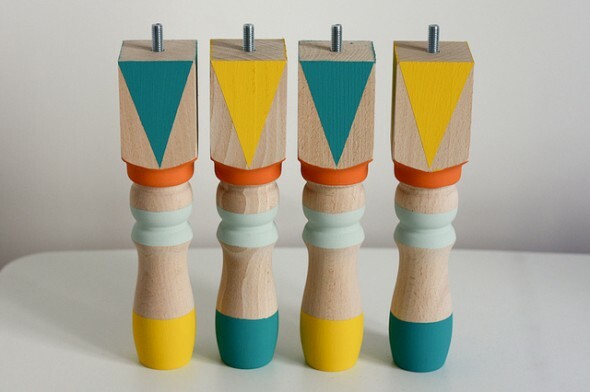 Adding detail to the legs would be a great DIY fix too, like this fun bright pattern painted on ordinary sofa legs! And here is what I did. Spent the better part of my Saturday cleaning, sanding, priming and painting it this nice glossy grey. I had originally planned on a hot pink or watermelon red but in the end went with a nice clean grey. The ladder in the photo is another street find and will most likely be my next project! These days, wallcovering is not only coming back into trend but people are breaking all the rules and installing it wherever, however they please. 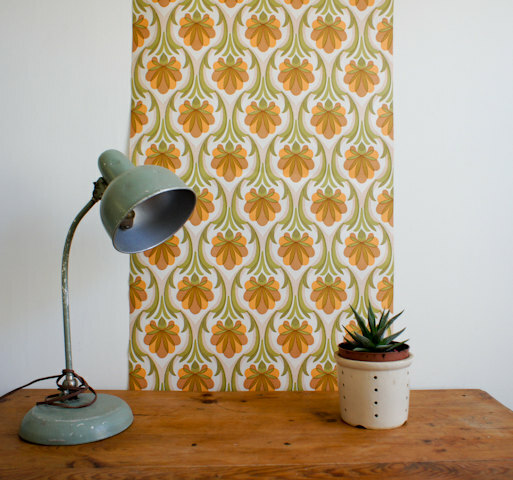 Gone are the days of a single pattern installed on each wall in you space. Put it anywhere and make it yours! Check out these tricks to get the most out of less yardage! Is your staircase a snoozefest? Add decorative touches with some fresh wallcovering applied to the riser (the front of the step) to get just the right amount of pop you’re looking for and add pattern and pizazz to an often-ignored place. Or turn those boring, white doors into a special stop on the tour of your home with this genius idea. With the framing already in place, this project is so easy it should be illegal. Only have enough pocket change to afford wallpaper scraps? You can apply small pieces to your furniture or accessories for a thoughtful, coordinated touch. Most neighborhood design shops will let you purchase samples for under $5.00. 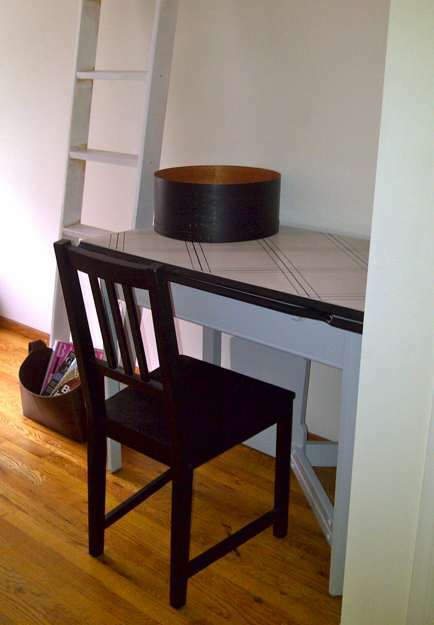 Finally – Install your favorite pattern above a chair rail! This will also help you save, save, save on yardage and installation and, when you get tired of your paint colors, its a simple change helping you update your whole space. And don’t forget to always use your imagination. You can cover anything with wallcovering, including storage boxes, that ugly tack board in your kitchen, that scuzzy old clipboard you use at work, even your kids’ text books for school! Seen any cool rooms you’d like us to recreate frugally? Submit your photos and questions on our facebook page.